FROM JASON’S DESK, NOT HIS COUCH — I don’t watch television anymore, although I do watch an awful lot of television shows. Apparently, television has never been more popular. Nielsen Media Research said in February that the average American watches 151 hours each month — up from 145 hours during the same span last year. And as electronics become cheaper and the technology curve continues its exponential spike, televisions continue to fly off the shelves. 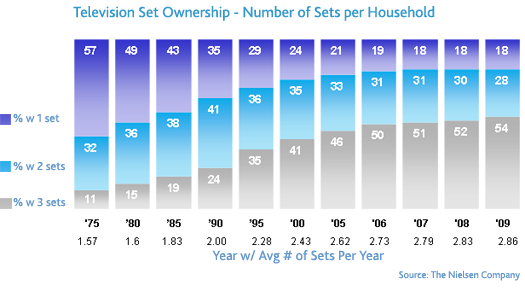 There are an estimated two billion sets worldwide. In the United States, more than half of all homes now have three or more, with the average of all homes at 2.86, Nielsen’s Television Audience Report concluded. 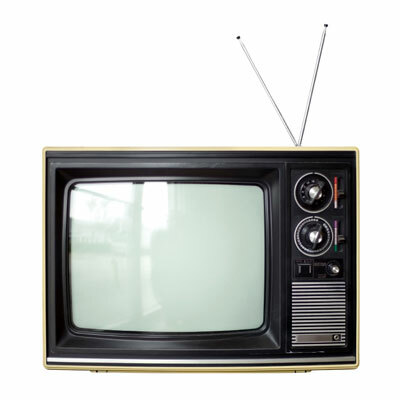 Two decades ago (1990), the average was just two television sets per home. I certainly have contributed to the jump. Not only do I have the 42-inch plasma in my living room, but I’ve got the 36-inch set in my bedroom, the 38-inch box in my den, and a 19-incher on the kitchen counter. The truth is that I watch none of them. My television viewing is done online these days — and so by all rights it should be called webivision viewing. Corporate sites like Hulu, YouTube, and [AdultSwim], combined with the greymarket of TV Links and QuickSilverScreen, have supplanted the need for a crude television set. The results have been disastrous, serving only to further erode my limited attention span. I used to slump in front of the tube and keep my eyes glued to it… now I can hardly watch five minutes without opening new tabs, checking mail, catching up on a forum argument, catching a quick webcomic, or browsing my Google Reader subscriptions. It makes for a much more franetic, less-informed, even cheapened viewing experience. Widespread availability of show content doesn’t help, either. It used to be that I had to wait from week to week to get the next episode of Star Trek: The Next Generation, Boston Legal, Arrested Development, or what have you. That built in the element of delayed gratification: distance makes the heart grow fonder, and all that. Now I can hit Hulu and be watching any or all episodes of Dead Like Me or Sliders inside 20 seconds. It’s like celebrating Christmas everyday; it sounds great, but after a while, the presents just aren’t special anymore. And that means I’m less likely to watch and appreciate all of any given show. There is far more Grade-A content out there to watch now than I can ever consume, which means I’m not obligated to stick with the cream of the crop through to completion and I can float on to the next pilot or premise that catches my wafting interest. That’s why I’ve only made it through the first three episodes of Spaced since Hulu posted the first and second seasons last week. There’s no pressure to get those episodes while the getting’s good. Meanwhile, my big plasma upstairs is being slowly tortured. It’s stuck by wifely command on HGTV for hours at a time, with breaks for Live with Regis and Kelly, The Bonnie Hunt Show, or any fashion/cooking reality show aired by Bravo. That poor television must be begging for the sweet release of death. I honestly can’t remember the last movie I watched on that blessed set. It was probably Transformers: The Movie from 1984 (the animated one). If it weren’t for the wife, the plasma would be hooked up to my computer. Were I a betting man, I’d say it’s only a matter of time before all televisions are just Net receptors, and that traditional, passive cable or satellite are going the way of the dinosaur. That is, if the companies that control media can get their noses out of their proverbial asses and get in touch with the inevitable realities of our shifting culture. This entry was posted on Friday, August 7th, 2009 at 8:47 am and is filed under Intarwebbery, TV/Film. You can follow any responses to this entry through the RSS 2.0 feed. You can skip to the end and leave a response. Pinging is currently not allowed.